Perhaps the game Avenue was too cosmopolitan for you. If that’s the case Indie Boards & Cards’ rethemed Kokoro: Avenue of the Kodama might be more to your liking with its bucolic setting and flowery dress. In either case, it’s time to draw lines for fun and point-profit. The object is to score the most points. Resurgence of the magical lands is a good thing; it also means it’s been a while since someone took a weed-whacker to the joint so getting around is a leafy nightmare. 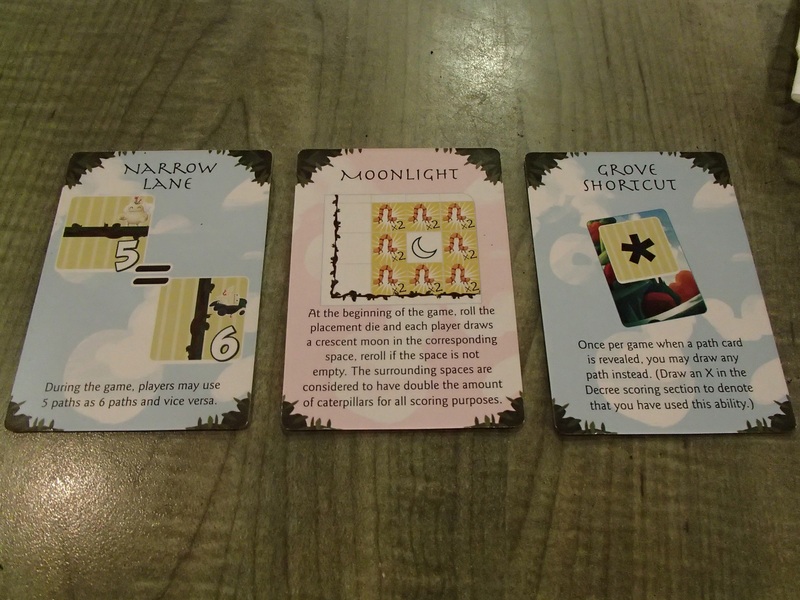 One to eight players portray kodama (“echoes”) who offer to clear a path among the various sanctuaries so the guardians can get back to guardianing. Play happens simultaneously on identical boards. These surfaces show a grid of squares with caterpillars, flowers, and sanctuaries, as well as a home space for the caterpillar guardian and the flower guardian. One of the six lettered sanctuaries is chosen at random out of a deck, and one of the players starts dishing path cards out of another deck. Paths all have a background, either “normal” (with a bit of illustration) or “golden” (with a yellow border); a number from 1 to 6; and a corresponding line. Depending on the number the line may go left to right, top to bottom, or from one side to an adjacent side to form a 90-degree angle. Participants must draw that line on one of the squares on their grid. They can put it anywhere they like, but they’re trying to score this round’s chosen sanctuary so it’s best to concentrate one’s efforts there and to connect an unbroken path of lines from the building to some of the symbols around it. Unless mindful, it’s easy to end up in a dead-end situation for some areas, and there are still four more rounds after this one. Cards keep coming and lines are drawn until four golden paths are revealed; that ends the round and players count the caterpillars and flowers they managed to string together. A new round starts with a different random sanctuary (though the established paths stay on your board), and the process begins again. On each successive excursion one must score more points than the previous time or else they score zero for that sanctuary – too much success can cripple one’s game. The longer the action goes, the more solidified one’s path becomes and the harder it is to find (and the more foolhardy to expect) the right line at the right time. 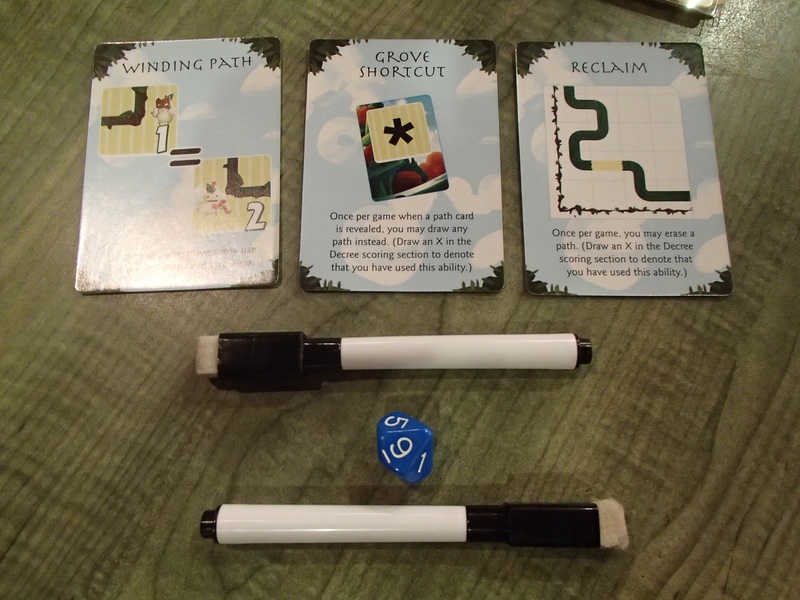 Making this slightly easier (and giving one a good reason to pass when an inconvenient line shows up), once per round players may peek at the sanctuary deck to see which letter is coming up next, giving them a chance to account for that when deciding the direction of their paths. There are also guardians in two corners, one for each symbol, and one gets bonus points for hooking them up with their matching icons, so that gives the players other locations to place their paths. The game plays out over five rounds at the end of which points are totaled for both the sanctuaries and the guardians – and penalty points are subtracted for any 0-scoring round. Dry erase boards must have plummeted in price, given how many games these days utilize them. Those in this set suffer the same advantages and troubles as any other – after the first use there always seems to be a layer of just-can’t-quite-get-it dust from the included pens. Odd, given that the pens are remarkably (no pun intended) good at erasing. Heck, it’s actually more fun to erase than it is to draw. The symbols are legible across the playmats until you start drawing lines; then they get lost under the ink, not to where you can’t read them but any doubletake is one doubletake too many. The sanctuaries don’t get hidden; rather, they do rather a good job of obfuscating any lines drawn into their space. The artwork is pleasant, lending a quaint look to the finished product, though the sanctuaries do come across as looking like a mix between a birdhouse and an outhouse. The rules are okay but they feel a little unfinished. While most of the samples are pretty well drawn out the guardians don’t appear in any of the illustrated examples. It might be a stretch to claim they’re not described enough, but giving them the same footing as the other examples would have gone a long way toward allaying players’ fears they’re being employed correctly. Avenue, the game from which Kokoro was derived and rethemed, is only a couple of years old, so it seems odd to revamp the whole thing so early on. That may just show the game’s popularity, which is deserved. 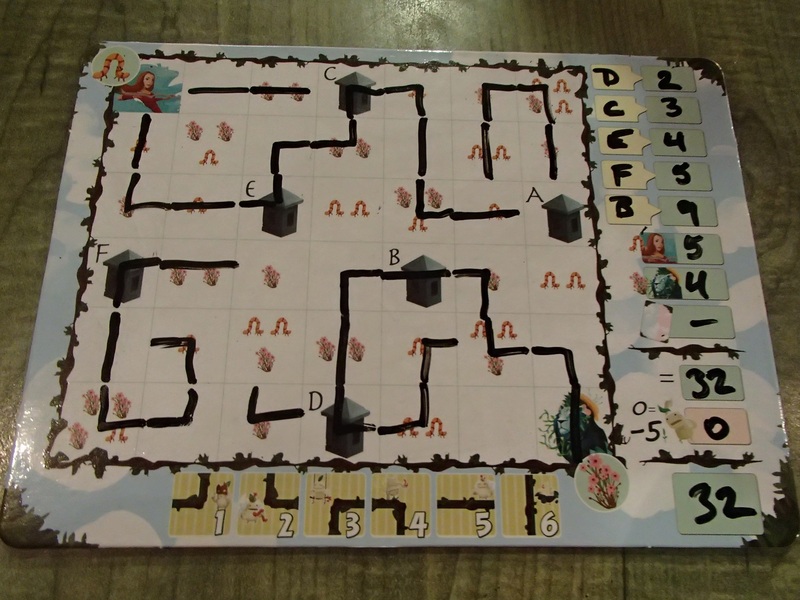 It’s an entertaining, kid-friendly, still-good-for-adults family game that can be an afternoon’s fun for the whole clan or connective tissue for more mature gamers who don’t mind some whimsy so long as it offers a bit of a mental challenge. To that end, the pink back of the double-sided boards is a good variation for what could become a stagnant offering – not only is the setup different but the guardians here are placed randomly with a roll of the included 10-sided die. Otherwise, making as rounded a circuit as one can seems to be the best strategy for the standard blue side of the mat, but also the most repetitive over multiple plays. (One still must balance placing paths on the guardians and the sanctuaries throughout.) The Indie Boards & Cards team (including the original designers) also saw fit to include decree cards to further mix things up. 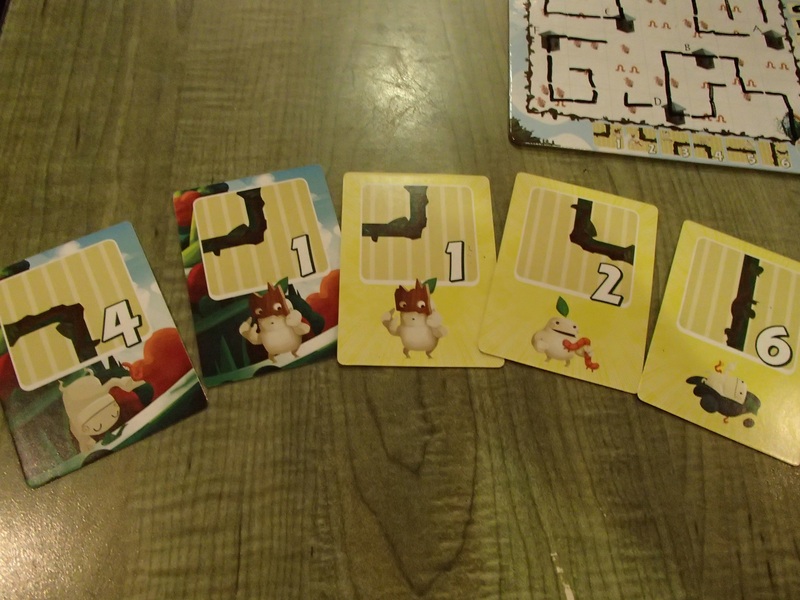 These offer either new ways to score points (like doubling scores around a fixed point) or additional rules (like allowing the kodama to erase or change a misplaced line during a game). If you liked the “checklist” dots on the road card display in Avenue, you’re out of luck – those are gone. Good card-counters have an advantage here unless one feels comfortable working out a system for marking their board as they go so they know what’s been played. The rules offer no advice as to whether that’s considered cricket. 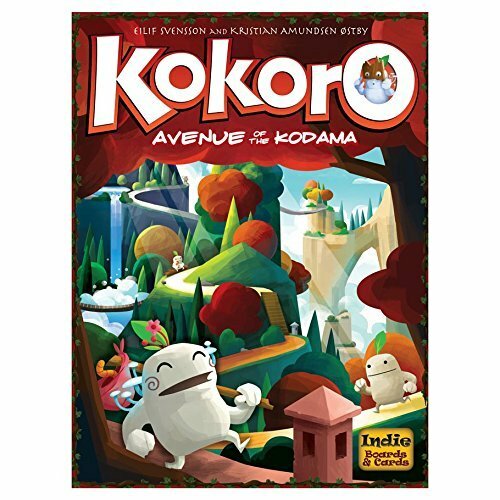 There are a dozen little things about Kokoro: Avenue of the Kodama to find fault with but the play isn’t one of them. It’s still a solid, serviceable, pseudo-artsy game where spatial awareness seems on par with math and pattern recognition, and a little changeup in strategy couldn’t hurt from game to game. The dry-erase is an improvement over a pad of grids, the decree cards keep things from getting stale, and the joy, simplicity, and ingenuity have been maintained.